A traditional Heat Pump is a type of heating and/or cooling system that uses the temperature differential between the air inside of your home, and the air outside of your home. 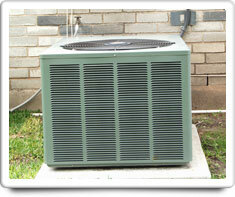 A Heat Pump consists of an outdoor coil, indoor coil, and a compressor. In warm weather, the indoor coil picks up heat from the indoor air and transfers it, using a circulating refrigerant and a compressor, to the outside air In cold weather, the opposite takes place. The indoor air is circulated throughout the indoor space using a blower and duct system. Even when it is below freezing outside of your home, there is still heat energy in the air. During the wintertime, a traditional Heat Pump is designed to extract the heat from the air outside of your home, and use this as a source of heat for your home. And if your Heat Pump is designed to be part of your central air conditioning system, then in the summertime the process is reversed, and your Heat Pump will extract heat from the air inside of your home and transfer it outside of your home (cooling your home). A traditional Heat Pump is different than a Geothermal Heat Pump. A traditional Heat Pump uses the outside air as the heat source or sink, where a Geothermal Heat Pump uses the ground about 20 feet below the surface as the heat source or sink. If you have Central Air Conditioning or Forced Air Heat with your traditional Heat Pump, then you should also put a checkmark to include them as part of your home features in your Home Wizard app. Central Air Conditioning, Forced Air Heating and Furnace (gas). Shown in the 'Routine Care' section are the recommended routine maintenance tasks for your heat pump (traditional). The 'Q & A' section shows answers to common questions. And the 'Articles' section provides helpful articles about your heat pump (traditional).